His father died in the First World War when he was 3. A cross stitch embroidered sampler was made for him and in memory of his father. the dark fog of a toiling city and of no avail. The embroidery also contains the insignia of the Coldstream Guards and at the centre a boy pushing a hoop. His mother married the Duke of Topor and he was living in Mexico in 1955 and took legal action against his step father, Ossolin, the Duke of Topor, over the amount of money he was receiving. John Evelyn Platt died a bachelor in Mexico on April 3rd 1960 aged 47 with his estate going to his Aunts Mary Carmichael Davison and Jesse Ross Carmichael Shipley. 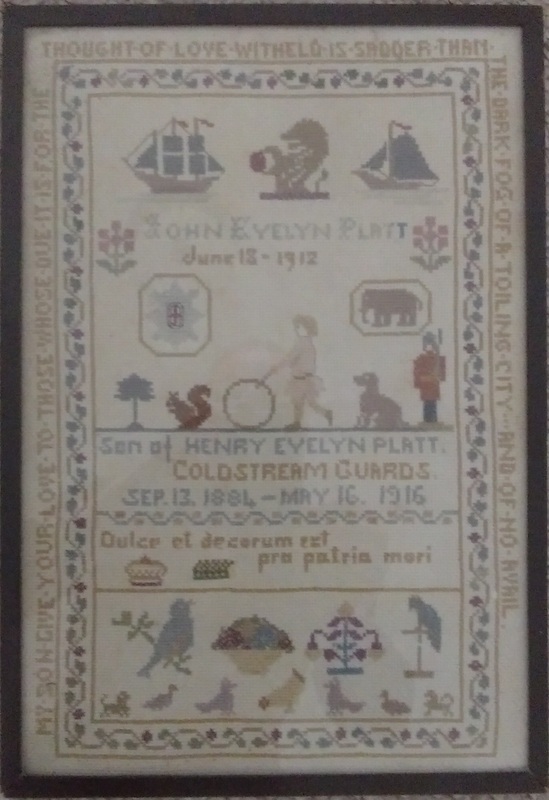 Sampler made for John Evelyn Platt and in memory of father HEA Platt. (Many thanks to David Keating for emailing me about its auction in May 2017 and for tea!